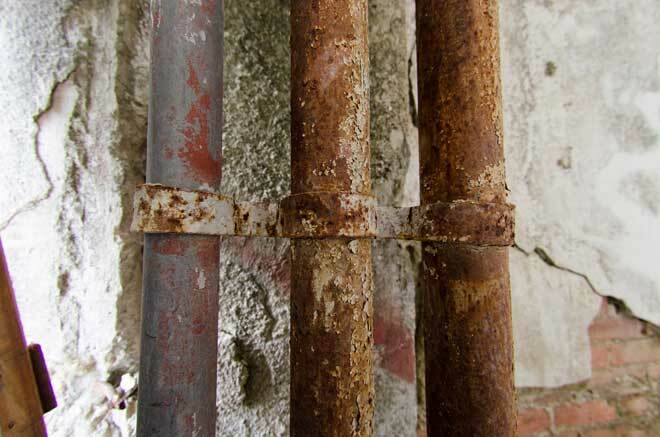 Rot is one of the most dreaded causes of home damage. While wet rot is a term you might not have heard of, dry rot likely conjures images of large repair bills comparable to termite damage. Whether you are currently suffering from a dry rot problem or simply wish to take preventative measure, it is important to understand what dry rot is, what it does, and how to fight it. 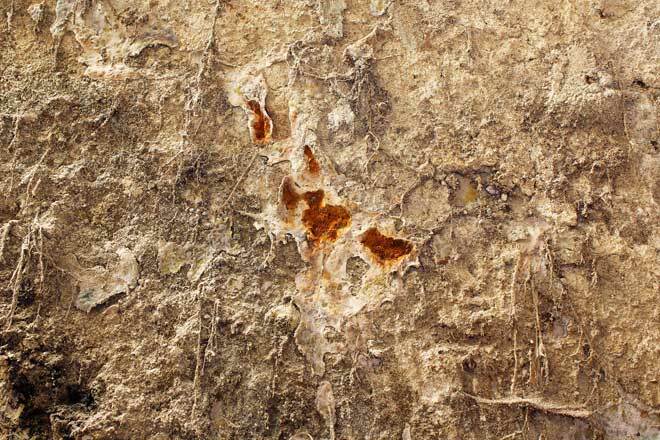 Dry rot is actually a species of wood fungus known as Serpula lacrymans. This fungus normally feeds off of woodland timber, but is known to also affect wood in both ships and buildings. Its common name comes from the way in which it consumes the cell walls which give timber its strength, leaving it dry and brittle. In order for dry rot to occur, the wood must first be exposed to excess moisture and air. As this moisture permeates the wood, it becomes a breeding ground for bacteria and micro-fungi which in turn begin to break down the wood’s cell structure. This creates room for more moisture. Once the moisture level exceeds 30 percent, the wood is susceptible to the dry rot fungus. As with many fungi, dry rot spreads through airborne spores. Upon landing in a hospitable location, the spores germinate and begin to spread rapidly. Colonies of dry rot are known to spread through masonry in search of additional wood, creating even more damage to your home. Due to the fact that dry rot spores exist throughout the atmosphere, your home is already exposed to them, even if the wood itself is not infected. When spores take root on a piece of hospitable wood, they begin to take root. These roots, or hyphae, grow and merge to create a white, fluffy-looking growth known as mycelium. Mycelium growth eventually becomes weakened by exposure to sunlight or the absence of moisture, air, or consumable wood. At this stage, the fungus begins to produce spore caps known as sporophores, which release more spores into the air. The new spores then spread and land on surfaces, causing more dry rot when the conditions are right. 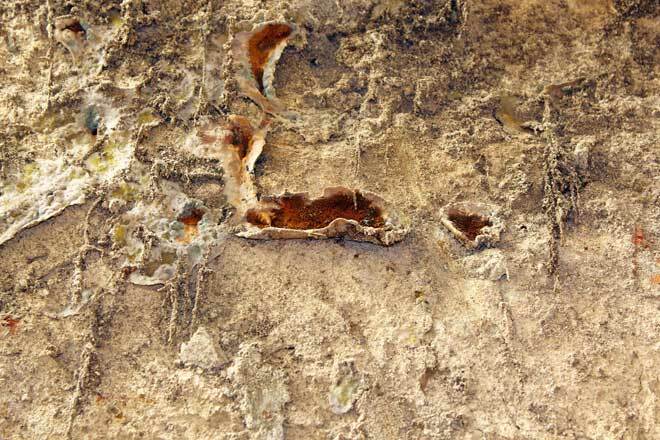 Due to its ability to spread through masonry and other structural elements, it is important to identify whether the rot you are suffering from is dry rot. Luckily, there are several characteristics which make the fungus more easily identifiable. The visible growth, called mycelium, is a whitish growth resembling thick cotton. The growth sometimes leaves behind a texture resembling snakeskin and can form teardrops. Strands may develop in the mycelium that become brittle and can crack when you bend them. The spore-producing sporophores are soft and may be in a pancake or bracket shape with wide pores. Their surface has an orange-like color. Red spore dust may also be visible around them. Finally, the fungus may develop a skin in less humid conditions that ranges from a silky grey to mushroom white color. This is often tinged with patches of yellow or lilac color. As with edible mushrooms, the skin on dry rot may be peeled away. Even if you can’t see the fungus itself, there are two major signs of a dry rot problem. The first is a musty, damp odor caused by the wood decay. Second, and more visible, is the damage to the wood itself. Wood which has been consumed by dry rot will appear shrunken, dry, and cracked in a pattern that resembles cubical shapes. The single most important step in treating a dry rot problem is to get rid of the source of moisture. This may involve repairing a damaged roof or wall, replacing leaky pipes, or other measures. Afterwards the wood itself must be dried, and you may wish to add additional ventilation to help reduce humidity. After these basic steps have been taken, there are several treatment options available. Borate-based preservatives are often used to treat new wood, and may also be used as a means to destroy dry rot in existing wood. This method involves either drilling holes in the affected wood and injecting a borate solution or spraying the solution over the infected wood. The most common borate solution used for treating an existing problem is Bora-Care. Tim-Bor is another popular borate solution which comes as a water-soluble powder that is sprayed onto all wood surfaces. The coating may protect your timber for up to 30 years and is also commonly used as a termite barrier. A major downside to using borates is the fact that they’re water-soluble. 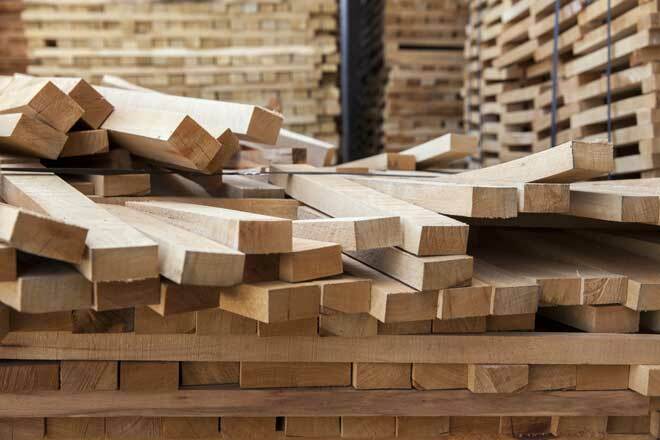 While this helps them penetrate the wood more deeply, it also means the protective coating will wash away over time if there is an ongoing moisture problem. Any white coating which appears on the wood’s surface after treating must be washed off and that area allowed to dry. Another popular chemical treatment method, glycol is a chemical component in antifreeze and other de-icing solutions. Ethylene glycol may cause serious health problems with too much exposure. Propylene glycol, alternatively, is made using less toxic chemicals. While glycol treatments may become diluted or wash away in a high-moisture environment, it can be sprayed on painted or coated wood surfaces, absorbing into the wood quickly without damaging the surface. The exceptions to this are epoxy and polyurethane, which are more resistant. Dry rot is susceptible to high temperatures. Thus, some heat-treated methods used in pest control may also be used to treat dry rot. Two of these methods are heat fumigation and microwave treatment. For heat fumigation techniques, specific rooms or even your entire home is covered in tarpaulin. All heat-sensitive objects are removed from the treatment area, which is then heated to dry out and kill the fungus. This method can be very expensive and is not widely available. Alternatively, microwave treatment is a newer method which requires special equipment. The use of microwaves can be effective, but it’s also costly and can only target small areas. Microwave treatment can also cause heat damage, making its use far less favorable than other, more proven methods. While not as effective, it is possible to make rudimentary fungicides out of common household ingredients. Many of these products alter the pH balance of the wood, making it less hospitable to the dry rot. Examples of common household products used include hydrogen peroxide, baking soda, and vinegar. There are some commercial fungicides made from similar ingredients, although chemical fungicides have more field testing. An expensive but highly effective method is to remove all wood which has been affected by dry rot. The surrounding areas should be treated with fungicides to kill any additional traces of the fungus. This method has been traditionally used to combat dry rot, which was considered very difficult to eliminate. As more methods arise to get rid of dry rot for less cost and effort, it is becoming less common to replace wood which has not been seriously compromised. 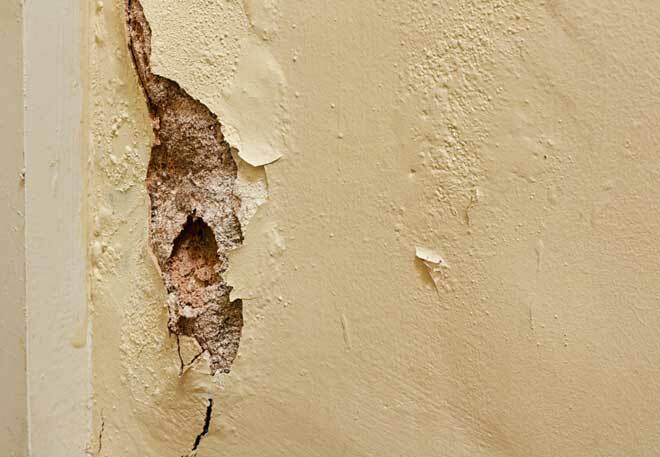 Once you have treated the dry rot, you will need to address the damage left behind. In some cases such as replacement, you will be dealing with the installation of new beams, posts, or other sections of wood. Where there was only minor damage to wood that isn’t load-bearing, such as a baseboard, the rotted portion may be cut away and the resulting space filled with an epoxy compound. Any wood which has been compromised should likewise be removed or trimmed. Dry rot needs three things in order to survive. The easiest and most practical of these three to eliminate is moisture. Moisture can be caused by a variety of sources, some of which are naturally occurring, such as condensation. If your dry rot problem wasn’t caused by a leak or flooding, then you may wish to consider better ventilation. Modern bathrooms and attics or crawl spaces include vent fans to pull steam out of the room, reducing the risk of humidity-related mold or fungus. Alternatively, adding better insulation to an area where condensation was the cause may lead to much lower moisture content. An outbreak of dry rot in your home may cost very little if caught early enough. But what about repairing more extensive damage? Homewyse gives a basic estimated range of $319 to $728 for simple repairs using local materials and a contractor. CostOwl, meanwhile, accounts for more variables and gives multiple estimations. Simple, exposed repairs by a professional may run as little as $100 to $300, while wood siding can vary considerably, with costs generally ranging from $100 to $1,000, but sometimes running as high as $2,500. CostHelper gives similar estimates for these scenarios. When it comes to major damage, the price again varies based upon the area and importance of the damaged wood. CostOwl estimates $250 to $750 for repairing one small portion of porch, while a floor joist may be as expensive as $4,000 to $12,000. Again, CostHelper echoes these prices, suggesting a porch post might run $200 to $600 and a floor joist running between $5,000 and $10,000.